We isolated randomly 20 pairs of adult insects, newly emerged from nymphs fed with strawberry guava and jatropha in cages of plastic cups (700 mL). The fruits of strawberry guava and jatropha allowed nymphal development of P.
Different results were observed for jatropha and strawberry guava, which have fleshy fruits and, thus, more suitable for the nymphs to feed on. 5 for insects fed with fruits of strawberry guava and jatropha, respectively. Red strawberry guava fruits used in this study were donated by Embrapa Temperate Climate, from Pelotas, Rio Grande do Sul (RS) state (geographical coordinates: 31[degrees]40'47"S and 52[degrees]26'24"W: 60m altitude). For conventional jelly formulation (F1) was used (% m/m): 50 red strawberry guava pulp, 50 commercial sucrose, 40 distilled water, 0. Table 1 shows physicochemical and caloric value data of conventional and no added sugars red strawberry guava jellies. There was a higher titratable acidity in formulations without sugars addition, possibly due to the higher concentration of red strawberry guava pulp and, consequently, greater organic acids presence. The strawberry guava trees area is located north of the study site. 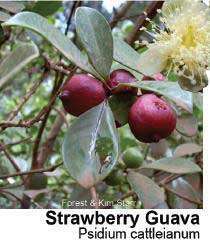 Strawberry guava trees do not require any management or phytosanitary treatment. 2012), who collected strawberry guava, surinam cherries, guavas, feijoas, Eugenia pyriformis, wild cherries, loquats, peaches and persimmons in Pelotas (RS), both registered the same specie of fly as more abundant. The highest indexes of parasitism in the years before and after release were registered in strawberry guava trees.